Gin tasting at Distillery No. 209; photo by Daniel Azarkman. The world’s only distillery built over water invites you to discover your gin personality while touring its scenic facilities. Once a month for the rest of the year, ~DISTILLERY NO. 209~ will bring a small group onto the premises behind AT&T Park and walk them through the gin-making process. Guests will sample a range of expertly-crafted cocktails to find out where they stand on the spectrum of gin drinkers. “Ginthusiasts” can deepen their appreciation as they learn new pairings and applications, while “Ginskeptics” on the other end may discover a new affinity for the spirit in this less juniper-centric and more floral take. Botanicals used in 209 include cardamom, coriander, cassia bark, and bergamot peel; the inaugural distillery tour on June 9th even showcased these flavors in some surprisingly good gin cupcakes. 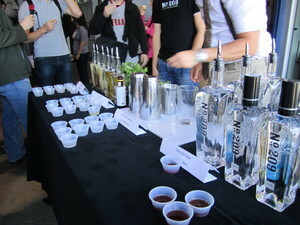 Spots in future tours are $25 per person, and can be booked online at 209gin.com or by phone at 415-369-0209. Pier 50 at Terry A. Francois St.